With the advent of internet sales, large chain beauty stores, “big box” retail store diversion and “professional-only” beauty store outlets, USP, Inc./ ENJOY Professional Hair Care has made a commitment to no longer participate in any of those channels of distribution. "As of November 15, 2017, ENJOY Professional Hair Care is no longer distributed or sold by any secondary distribution channels. All sales are direct to salons from USP, Inc./ Enjoy Professional Hair Care." 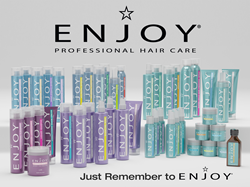 Ultimate Salon Professionals (USP, Inc.) is pleased to announce that all sales of ENJOY Professional Hair Care products are now 100% direct to salons. In light of the recent and continuing changes within the professional beauty industry, USP, Inc./ Enjoy Professional Hair Care has gone to a complete salon direct business model, eliminating all secondary distribution channels in order to ensure the integrity of the brand and provide a renewed commitment to the salon professional. As of November 15, 2017, ENJOY Professional Hair Care is no longer distributed or sold by any secondary distribution channels. All sales are direct to salons from USP, Inc./ Enjoy Professional Hair Care. With the advent of internet sales, large chain beauty stores, “big box” retail store diversion and “professional-only” beauty store outlets, USP, Inc./ ENJOY Professional Hair Care has made a commitment to no longer participate in any of those channels of distribution. It is our hope that this stance will be highly beneficial for the professional salon industry. In theory, by eliminating so many of the previous distribution channels, this will significantly reduce both licensed and unlicensed at-home hair services and help to even the playing field for the salon professional. It will create a more stable professional beauty environment. The plan for future growth internationally is to maintain the same manufacturer direct model to ensure the quality, authenticity, integrity and ethical standards to the professional salon industry. It is imperative to make a stand to support our professional salon industry and partners.